On Wednesday of this week, the BBC Radio Cambridgeshire Breakfast Show covered the issue of drifting in Orton Southgate and invited myself, a City Councillor, a Cambs Police Sergeant and a Peterborough City Council Director to respond to residents' concerns. A number of residents were also invited to express their point of view, as were two young men who enjoy the pastime of drifting elsewhere in the county. The piece came about after BBC Radio Cambs presenter Dotty McLeod read about the problem right here on this blog. I have posted a full transcript of the broadcast here. In summary, Cambridgeshire Police has apologised to residents of Orton Goldhay and confirmed that the police share the responsibility of addressing the drifting in Orton Southgate, while Peterborough City Council referred via a statement to measures that will shortly be put in place with the cooperation of the land owner to ensure that residents' sleepless nights are a thing of the past. I would like to thank BBC Radio Cambridgeshire, Dotty McLeod and her team for picking up this issue so enthusiastically on residents' behalf. I would also like to thank both Sgt Nikki Hall of Cambs Police and Adrian Chapman of Peterborough City Council for their robust response to residents' concerns. Last night was the first quiet Saturday night residents of Orton Goldhay have been able to enjoy in a very long time. Thanks to the support of BBC Radio Cambs and the response of Cambs Police and Peterborough City Council we hope that peace will soon be restored on a permanent basis, and that the people who enjoy doing and watching the drifting will have a place to do it away from people's homes where they can enjoy their pastime safely and without bringing stress to people who live here. I'm writing this with wet eyes, having just watched Sophie Morgan's powerful 2013 documentary 'License to Kill'. If you think you know that speeding is dangerous, why it happens and what should be done about it, I ask you to please watch Sophie's documentary anyway. Sophie adds a much needed fresh voice to the conversation about speeding. It's the voice of a young woman driver who drove without care when she was inexperienced. 18-year-old Sophie lacked the skills and understanding to handle her car at a high speed. As a consequence, Sophie's car crashed, and after weeks in a coma she awoke to be told she had lost her ability to walk for life. Sophie's powerful story isn't a simple moral tale about the consequences of driving too fast for thrills. From her perspective, she is able to explain why she did what she did the night of her accident, and what she believes needs to be done to prevent more young people from causing accidents that result in serious injury or loss of life. Sophie's documentary, highlights the dangers posed by newly qualified drivers. But what about drivers with 10, 20 or even 30 years of driving experience who pose grave danger to people, pets and property by driving too fast and too carelessly along our residential streets? These are the drivers who feel safe in their powerful cars and safe in the knowledge that their experience will protect them from having an accident. I receive more emails and phone calls from residents about speeding than I do about any other issue. The emails and phone calls fall into two categories. Peterborough Green Party supports a national campaign called 'Twenty's Plenty', which calls for speed restrictions of 20mph in some residential streets. We recently wrote an article for the Peterborough Telegraph to explain why 20mph can save lives. I've pasted the text of the article below in case you missed it. We need to change our attitude towards speeding. Why 20 is plenty. Have you witnessed ‘near misses’ on the residential streets where you live? Have you heard that yet another beloved family cat has been crushed to death under the wheels of a car? Are you worried that your child isn’t safe on the streets near their school because of speeding motorists? Let’s be honest. Have you ever driven faster than 30mph in a residential street? Do you believe that because you’re an experienced driver you are able to take the same remedial action to prevent an accident, whether you’re driving at 40mph, 30mph or 20mph? If you do, you’re wrong about that. You may believe that you are a careful driver, but if a pedestrian steps out in front of you when you’re doing 40mph it is five times more likely that your car will kill them than if you’re doing 30mph. The 30mph speed limit for residential roads was introduced in 1934. A lot has changed since then, including the type, size and capabilities of the cars on our streets. Car technology has improved greatly, making driving much safer for the person behind the wheel. Human technology hasn’t advanced at quite the same pace, meaning pedestrians have become more vulnerable as drivers have become safer. 30mph is safer than 40mph but it is not as safe at 20mph. 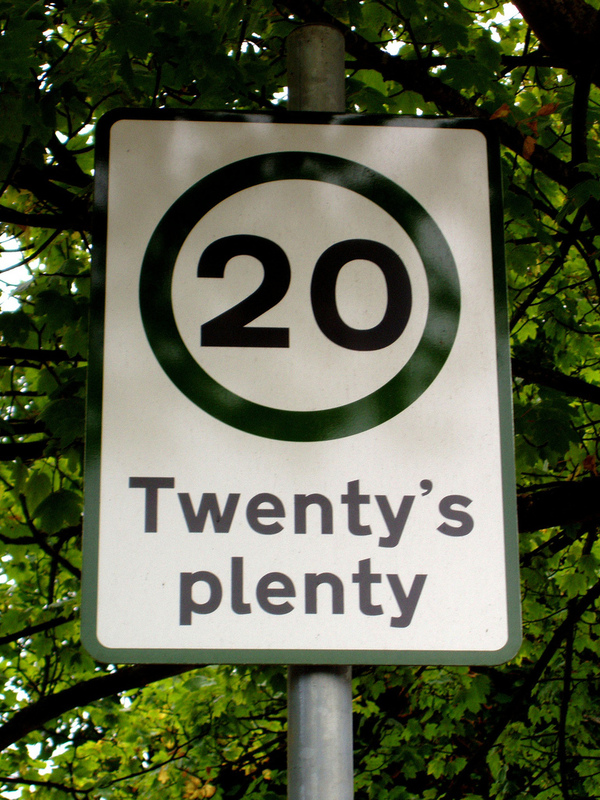 When it comes to driving on residential streets we believe that 20mph is plenty. Driving at 30mph rather than 20mph increases stopping distances by 134%. This isn’t due to your skills as a driver. The fact is, a car braking from 30mph will still be travelling at 22mph when a car travelling at 20mph will have stopped. In some situations, that’s the difference between life and death. If your car hits a pedestrian hit at 20mph they have a 95% chance of survival. This reduces to 80% at 30mph. At 40mph the chance of a fatality is 90%. Reducing your speed to 20mph has many immediate benefits. Traffic noise and pollution will decrease. Walking and cycling will increase as safety perception improves. In Hull, child pedestrian casualties dropped by 74% when widespread 20mph limits were introduced. 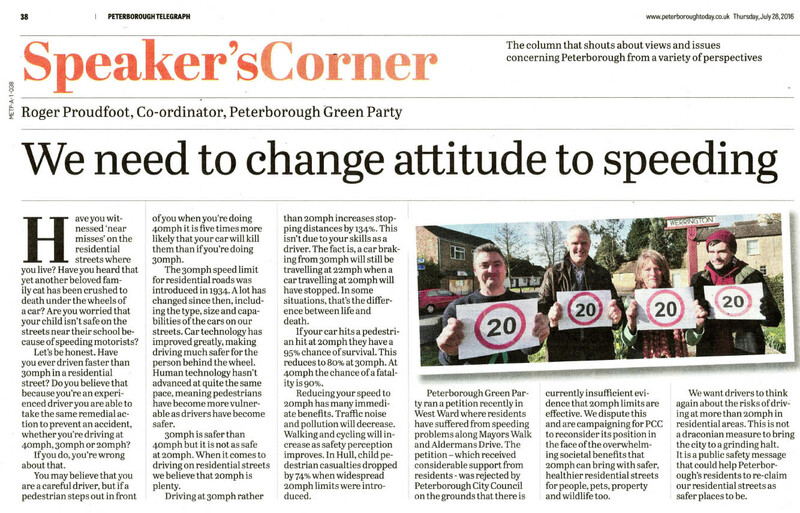 Peterborough Green Party ran a petition recently in West Ward where residents have suffered from speeding problems along Mayors Walk and Aldermans Drive. 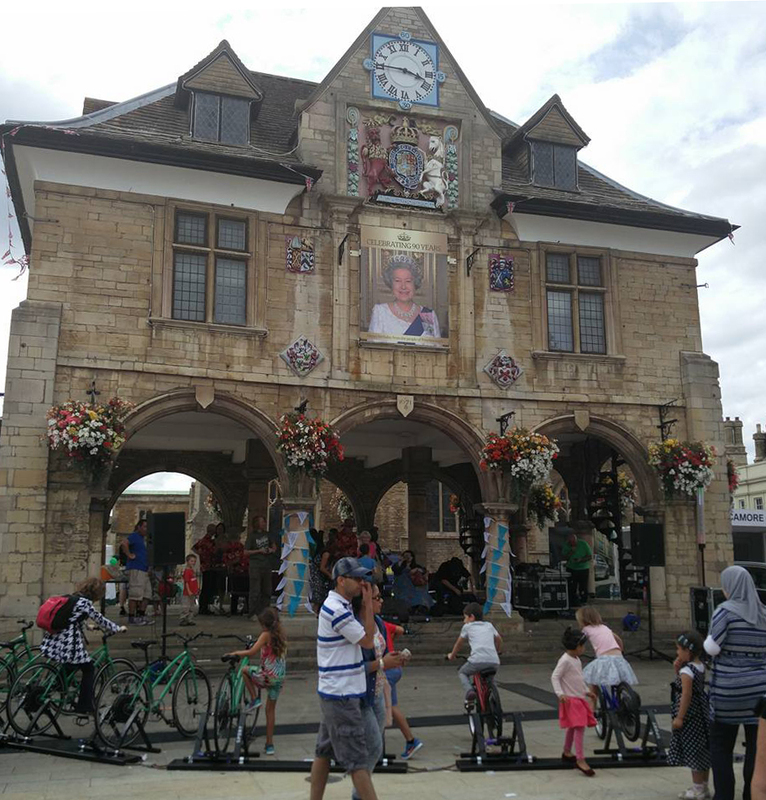 The petition – which received considerable support from residents - was rejected by Peterborough City Council on the grounds that there is currently insufficient evidence that 20mph limits are effective. We dispute this and are campaigning for PCC to reconsider its position in the face of the overwhelming societal benefits that 20mph can bring with safer, healthier residential streets for people, pets, property and wildlife too. We want drivers to think again about the risks of driving at more than 20mph in residential areas. This is not a draconian measure to bring the city to a grinding halt. It is a public safety message that could help Peterborough’s residents to re-claim our residential streets as safer places to be. Speeding and dangerous driving is causing other harm to our environment and huge distress to residents in some areas of our ward, in particular, to people living in houses in Orton Goldhay close to Orton Parkway. On the other side of Orton Parkway, lies the Orton Southgate industrial estate. On late evenings throughout the summer, roads on the industrial estate are being used for unauthorised 'car cruises' of the type Sophie highlights in her documentary. 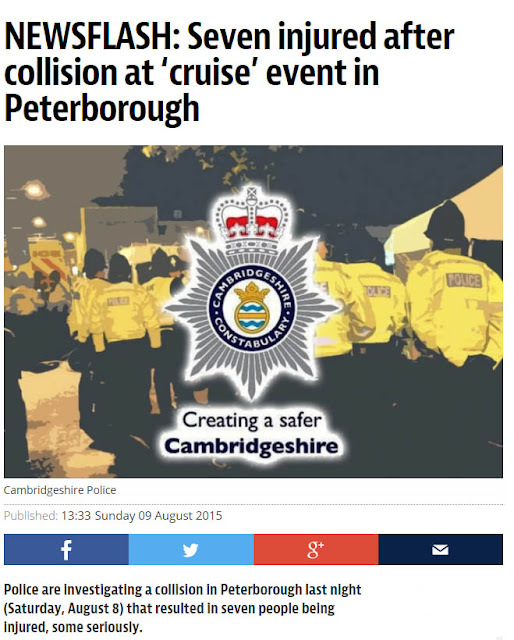 People right across Peterborough are aware with the dangers of these unauthorised and un-stewarded events. 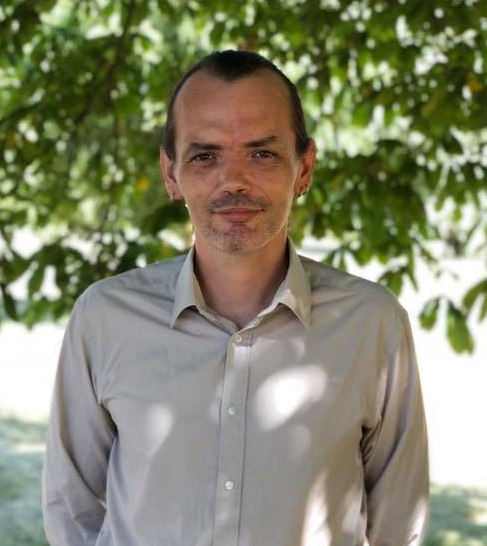 On 8 August 2015, several spectators were badly injured when an inexperienced driver attempted a manoeuvre that resulted in him ploughing his car into a group of bystanders. I've seen footage of the accident. It is horrific. The driver - who is from Stamford - is currently serving a prison sentence for what he did that night. The injuries and the trauma will be with the people he hurt for life. Read more about this incident. You don't have to hit people with your car to cause immense anxiety and distress to them. Residents who live in earshot of Stapledon Road, Orton Southgate (who live across the Orton Parkway in Orton Goldhay) tell me that their lives are being made a misery by the noise from screeching tyres that can start as early as 8pm and finish as late as 3am almost every night through the summer months, as the motorists who attend the unauthorised car cruise meets attempt to 'drift' their cars around roundabouts. Stress and lack of sleep can have serious, long-term effects on people's health. I'm told that residents are unable to open their windows on hot summer nights because of the noise, children cannot get to sleep, people who have to leave for work early the next day are exhausted and everyone affected is stressed and anxious from the moment the screeching of tyres begins. While some people are of the opinion that the people taking part in the car cruises are only a danger to themselves, this just isn't case. And it's not fair. The noise is causing real human suffering. If you are affected by the noise created by the car cruise, please call the police on 101. When you do, please remember to get an incident number from the call operator. The more times the matter is reported, the more likely the police are to prioritise your concern. 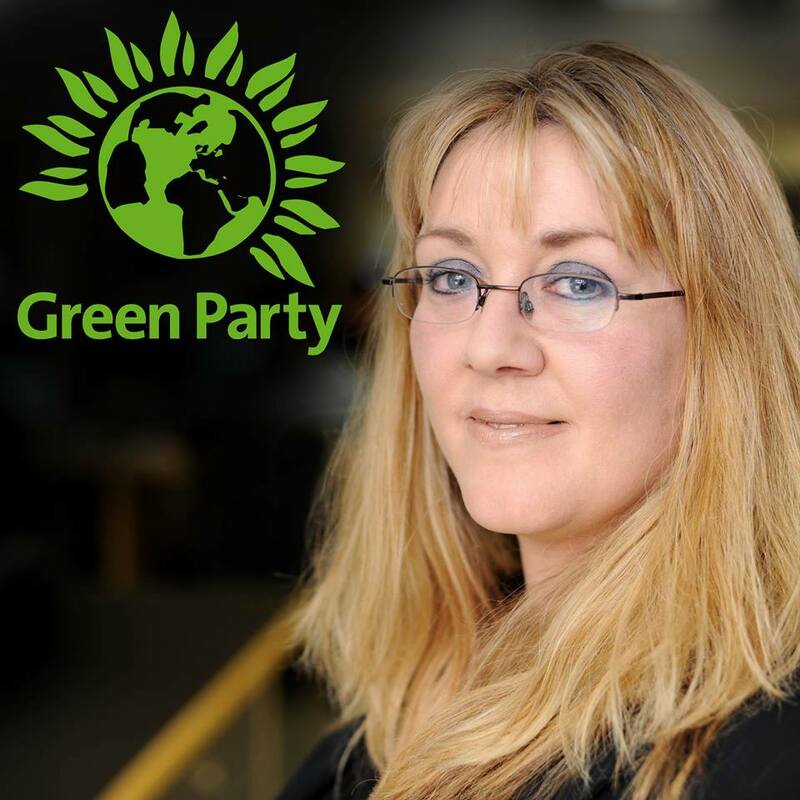 Peterborough Green Party has written to the Police and Crime Commissioner for Cambridgeshire asking for action to be taken. While we completely understand that it is far safer for drivers and the public that these events happen on industrial estates rather than on public roads (though, of course, roads on industrial estates are also public roads, just less busy on weekend evenings apart from lorries making deliveries), the noise nuisance is very harmful and it would be better for everyone if these events happened well away from residential areas. Residents should also call 101, the police non-emergency number, to report other incidences of dangerous driving. I know how much speeding cars worry you because you tell me all the time. I would be very interested to hear what you think about 20mph limits, traffic calming measures and speed cameras. What do you think is the solution to speeding on our streets? I make no secret of my love for Peterborough. I've lived in plenty of other great places but these days I don't particularly like leaving our parish, let alone our city! I make a few exceptions, however. One of my guiltiest pleasures is my annual trip down to Hatfield in Hertfordshire for Art in Clay, a festival of unique pottery artistry that I find completely impossible to resist. I have to confess, this has been going on for a while. 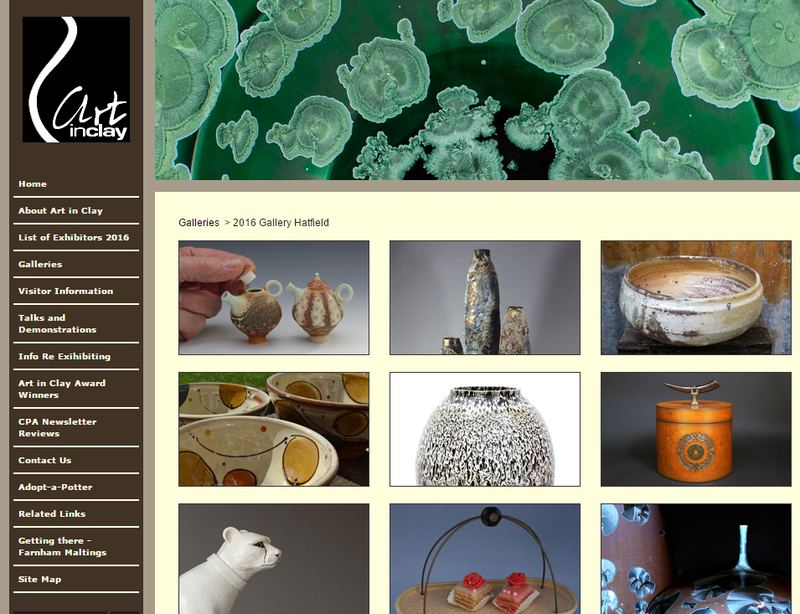 Di and Andy McInnes have been running Art in Clay since 2005. It actually takes place twice a year. There's a summer exhibition in Hatfield, Herts and an autumn show in Farnham in Surrey. And yes, I got to both of them every year. You see, I'm not into mass-produced tat. I like my surroundings to reflect how I am and what I am and what I believe in as far as is possible. I may be a Green, but I don't live a 'Good Life' existence (I don't have the skills or the patience - as you've already read, any veg in my garden grow there by magic, not by horticulture). But, where and when I can, I like to do my bit, by encouraging artists in their endeavours, supporting them in their businesses (by buying their work) and by getting to know them as individuals so that I can share their stories with people who might admire their pieces in my home (in the hope I might generate more business for them). This, for me, is part of being a Greener citizen and consumer. Of course, it would be better if the show was hosted at Peterborough Showground and Arena (hint, hint) so I could get to it on foot rather than drive to Hatfield. That would certainly be my ultimate dream (although I don't think I'd make a terribly good Showmaker at that event as I'd be too distracted by the many beautiful things). I've come to know some of the artists very well because I've been buying from them for over a decade. I know how their pieces are made, what they are made from and what inspires them. Can you say the same about a piece of plastic made in China bought from a supermarket? No, you cannot. I have enjoyed seeing some of the artists I buy from develop over the years. It's very exciting to see them work with a new material or draw their inspiration from somewhere new. It's a privilege to see master craftspeople develop over the course of their careers and an honour to enable them to do so buy buying and owning their work. When you buy directly from an artist you are buying something unique and investing in their future. This statement is never more true that when you buy from a young or emerging artist. Today, I bought two pieces from an artist whose work I've been collecting for over a decade. I also bought for the first time from an established artist who was new to me. Just before the three-day show closed at the end of the second day, I was delighted to buy a really exciting statement piece from a young artist whom I hadn't met before. Her name is Holly Louise Inglis. I'll introduce you to the other artists I collect from in future posts, but this one's all about Holly. What I buy depends entirely on what's happening in my life. Art - sculpture in particular - anchors me. I will always remember the circumstances under which I bought a particular piece so everything being 'right' when I choose what to buy matters. Women who have a fetish for buying shoes will understand what I mean when I describe how I feel when I'm drawn to something. My mouth starts to water. My entire demeanour changes. I pace around, looking at the work (and the artist) from different angles, imagining what it would be like to own this piece and how it will make me feel when it's in my home. I don't always follow through with a purchase. If I like the work but don't connect with the artist, I walk away. The 'story' of the piece is just as important as the aesthetic and I will gladly listen while an artist explains why they chose the medium and the technique that they use and why they decided on the particular subject. In other words, I didn't arrive at the exhibition thinking to myself that I'd love to buy an extremely heavy 3-D sculpture of a grotesque. Far from it. I went to the show today thinking it would be nice if I found something I could connect with that said something about my current life with the Green Party in some way. I was drawn to Holly's stand, not by the piece I eventually bought, but by the work you can see in this picture, the bird sculptures. In particular, the goldfinch. For me, goldfinches represent Peterborough. When I first moved to Peterborough in 2003, I had a bird feeder in my garden that was visited constantly throughout the day by goldfinches. Goldfinches are, arguably, the most striking of the finches living wild in Britain, thanks to their eye-catching red faces. When I saw these delightful sculptures I moved closer to the exhibition stand to take a look. Almost immediately, Holly said hello and invited me to take a closer look at her work (and to touch it if I wanted to - not all artists are happy to let you do this!). 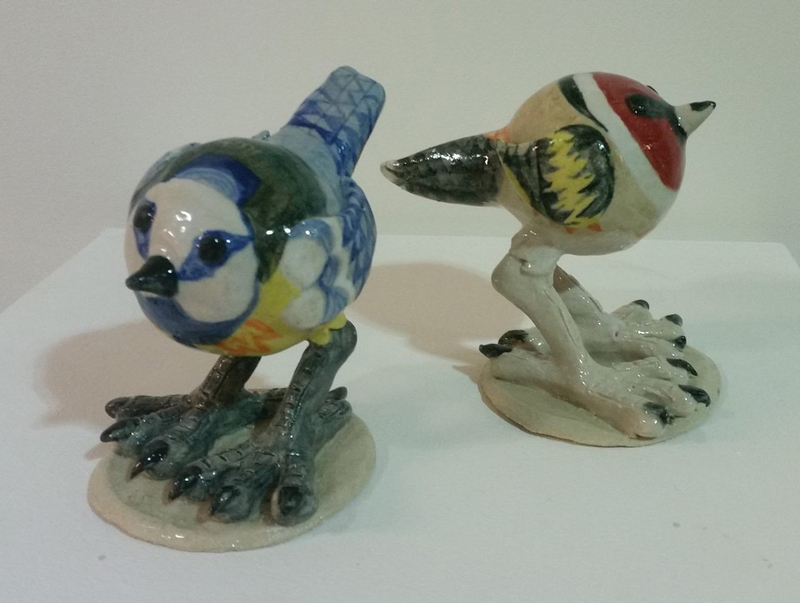 I asked Holly what inspired her to create sculptures of goldfinches and while she explained, I took a closer look at the other work on her stand. During that time, I got a sense for Holly and what all this meant to her and this made me want to help her in some way. As you may know already, I have a soft spot for helping and encouraging young people (I've been a mentor with University of Brighton for many years). I began to feel that if I could help Holly and support her in her endeavours then I should and I would. It was at this point that I noticed a large, incredibly heavy and almost finger-pad-shreddingly tactile monster of a 3-D sculpture called 'Nami', one of a series of sculptures that Holly has cleverly called 'Grotesque Natures'. 'Nami' is on the far left. This is a really interesting subject matter for me. I know that Holly was inspired to create this work because of her long-standing interest in the world of fantasy fiction. However, when I look at the work Holly has created, I'm remind that one person's 'ugly' or 'grotesque' is another person's 'difference'. Difference is Beautiful. Diversity in nature is beautiful. I didn't tell Holly about my role within the Green Party. She will be finding that out right now, reading this post. I hope this insight brings something useful to her work. 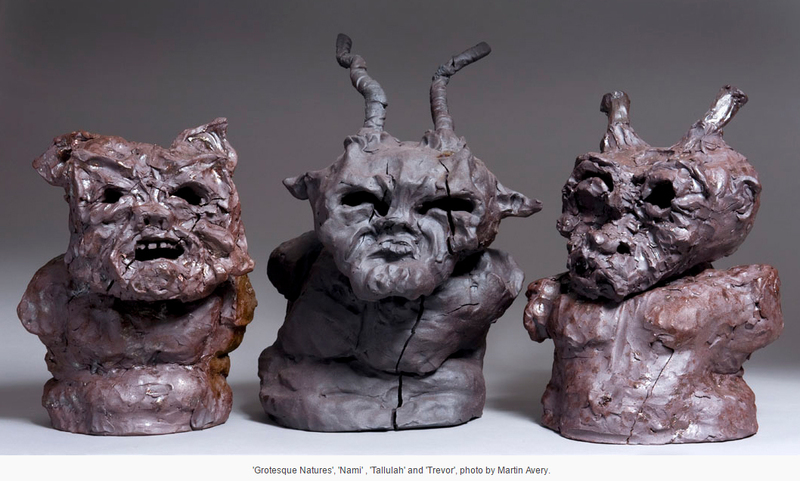 What she has created is a real talking point and I hope her other beautiful 'grotesques' will find their forever homes soon. 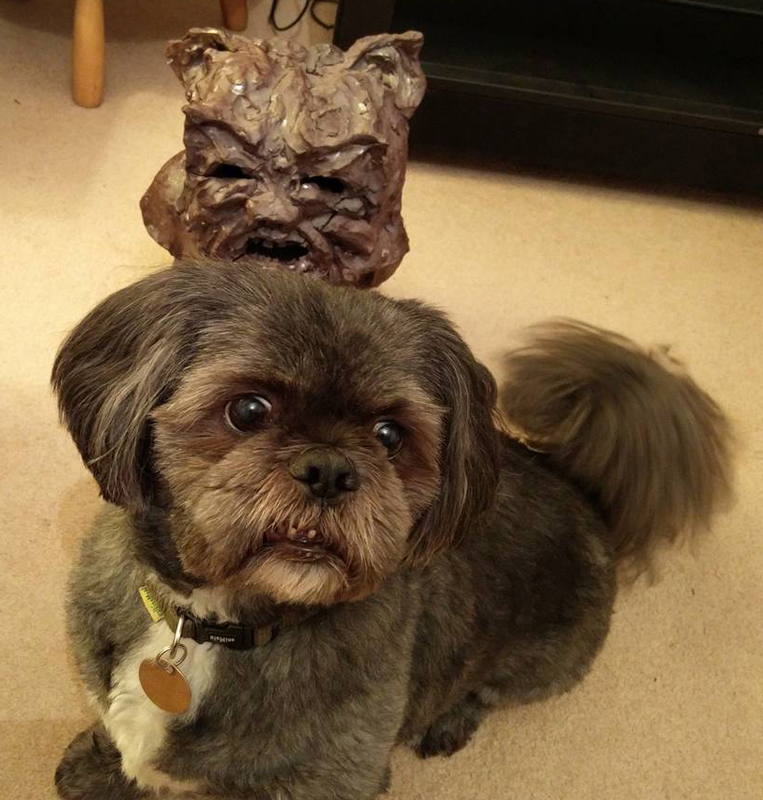 Holly explained that Nami was 'a peanut butter ceramic'. I didn't quite know how to react to this information. It sounded implausible. 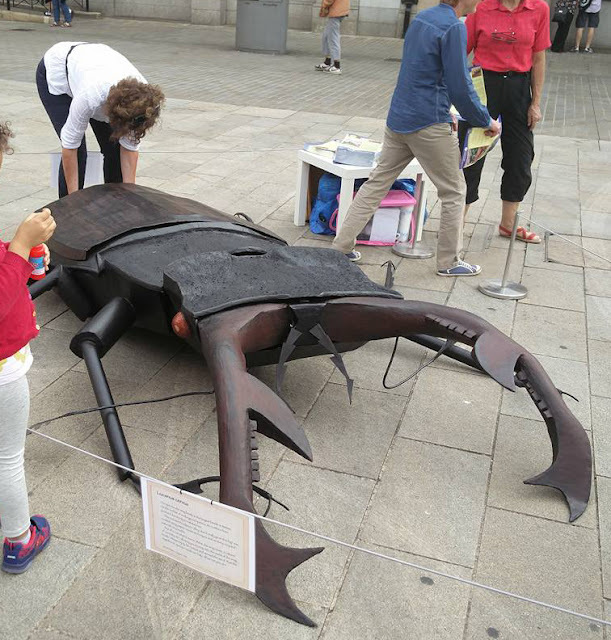 This big ceramic beast did not look like it was made from peanut butter. But I know when I'm in the presence of an expert so I said nothing. 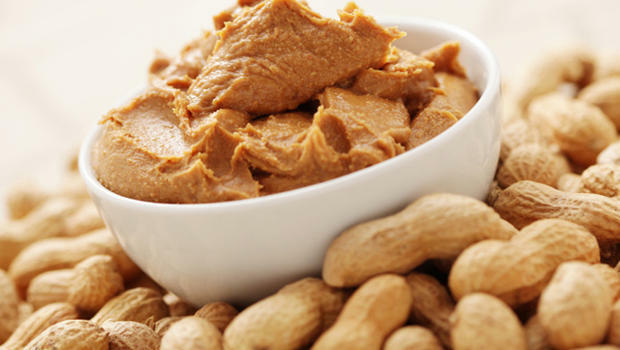 When I got home, I Googled 'peanut butter ceramic'. Turns out, 'reduction fired terracotta with peanut butter' an actual thing! You see, you can always learn something strange and new. So Nami now lives with me and I'm very proud to have him. He looks a bit like my dog. He will be with me through some interesting times. Just as Holly's experience of life enabled Nami to be created, now Nami will become part of my life story. People will see him and ask me where he came from and how he came into my possession. In the telling of the story of why I chose to buy Nami, awareness of why it's important to invest in young, emerging and established artists will continue to grow. 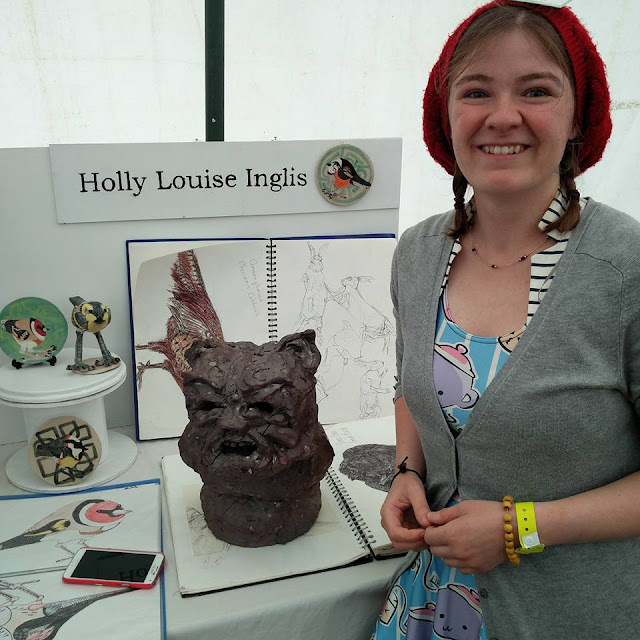 Visit Holly Louise Inglis on the web. Whenever I get the opportunity, I love spending time developing my family tree. I have a degree in Library & Information Studies, and a lot of curiosity and tenacity, so genealogy is the perfect hobby for me. Over the past couple of years, I have researched the lives of almost two thousand of my blood relatives. 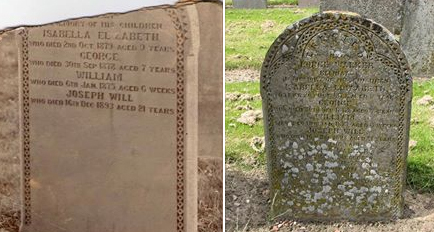 During my search, I came across two photographs of the same headstone, taken one hundred years apart. We are used to visiting cemeteries and trying to decipher the writing on really old headstones. 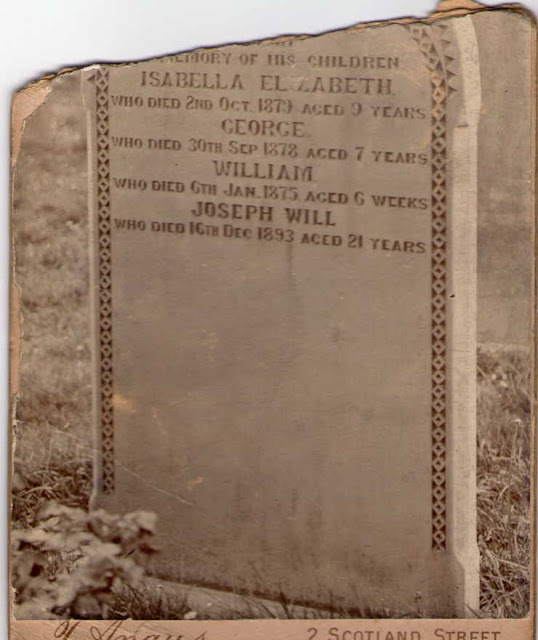 So it was fascinating to discover this picture that shows what the headstone looked like when it was relatively new. You may also have noticed that there are more names on the more recent picture. 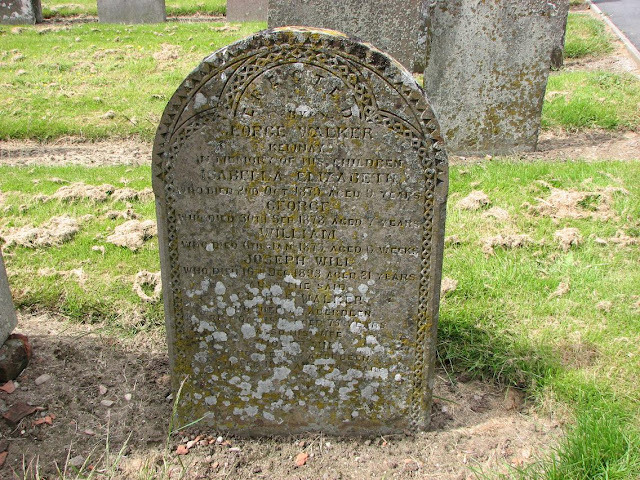 The four people named on the older picture are four children, distant cousins of mine, all of whom died in Aberdeen, Scotland in the late 19th century. 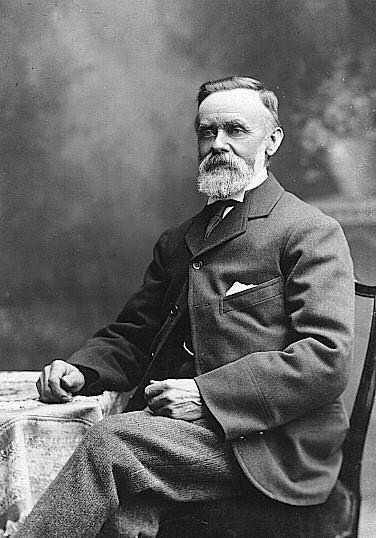 The later picture shows that their parents' names were added in the 1920s. If you've ever wandered around an old cemetery, you will have noticed that some older stones are in far better condition than some of the stones set more recently. This is all down to the type of stone used and the weather that the stone has been exposed to. The three main types of 'weathering' that a headstone could be subjected to are chemical (e.g. 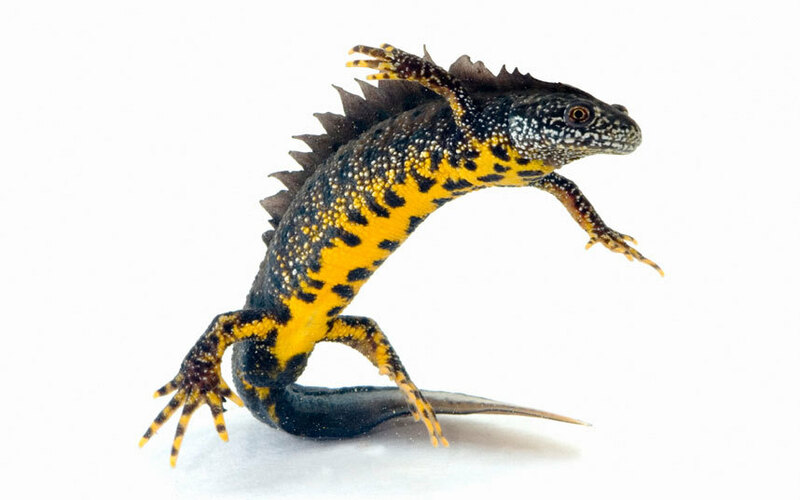 acid rain), physical (e.g. freezing and thawing many times over) and biological (lichen). It looks like my cousins' headstone may have been affected by all of these. If you are wondering what happened to this family, which lost four children at such an early age, you may be pleased to know that George Walker and his wife Violet would have six more children, all of whom survived into old age. I've just returned from a lovely afternoon at the PECT Peterborough Green Festival in Cathedral Square where all sorts was going on. 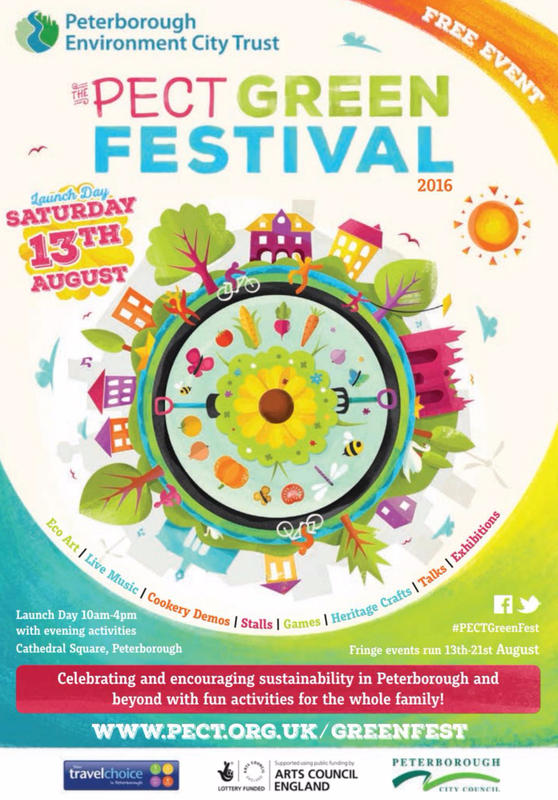 PECT is Peterborough Environment City Trust. 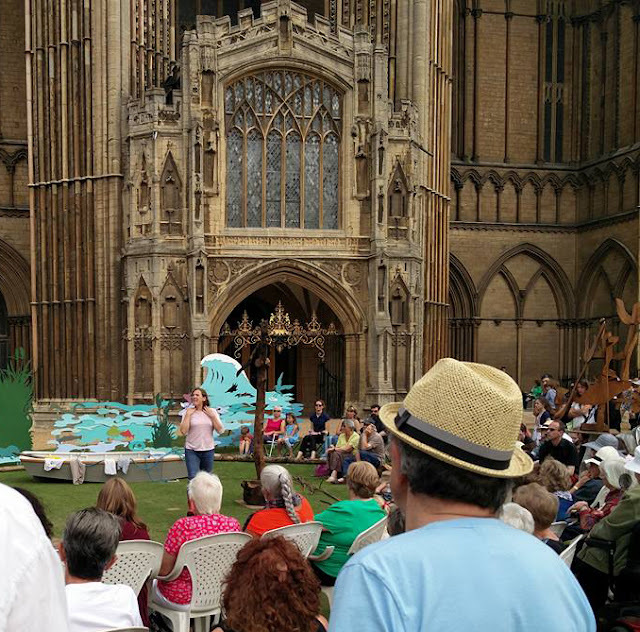 It is an independent charity, set up after Peterborough's designation in 1992 as one of four UK Environment Cities. PECT's mission is to protect and enhance the environment throughout Peterborough. It does this by delivering innovative and sustainable environmental projects right across our city. 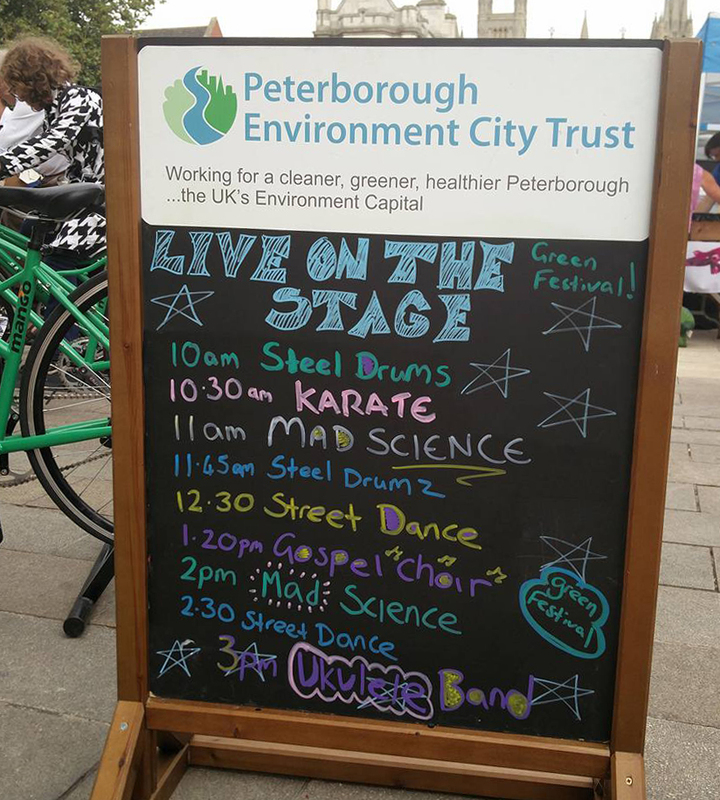 PECT's Green Festival is an opportunity to find out more about what PECT is doing for Peterborough and to become more involved in nurturing and protecting the city we all love and whose natural resources we all rely upon. I went along on launch day (Saturday 13th August), but the festival runs fringe events around the city right through until 21st August. You will find full details of the events still to come on the PECT Green Festival website. Video transcript: Hello, well it’s a special day today here in Peterborough because the Peterborough Environment City Trust has put on a special event that’s on today that is all about celebrating the environment in Peterborough and raising awareness. I’m going to have a little wander round and tell you a bit more about what it’s all about. This card says that in 2010 the charity Peterborough Environment City Trust launched ‘A Forest for Peterborough’, an exciting project to plant over 180,000 trees in and around the city and the surrounding area by 2030. And that’s just one example of the projects that are happening here. But let me show you what’s happening today. What’s really exciting is it’s already about 4pm here so we’re here quite late but there are loads of people here. So, let me turn the camera around to show you what’s going on. That’s actually the back of the beer tent! We’re by the cathedral here. Did you know that Peterborough has this amazing Cathedral, so if you come here do have a look at it. Peterborough is steeped in history. It really is a city by the countryside. It’s amazing. And if you can see over there, there’s actually a live play going on, so I’ll just walk past that and I’ll stop talking. There are absolutely loads of people here. It’s a beautiful day and that really helps but there are hundreds and hundreds and there are events right across Cathedral Square as well which is the square just outside the cathedral here. 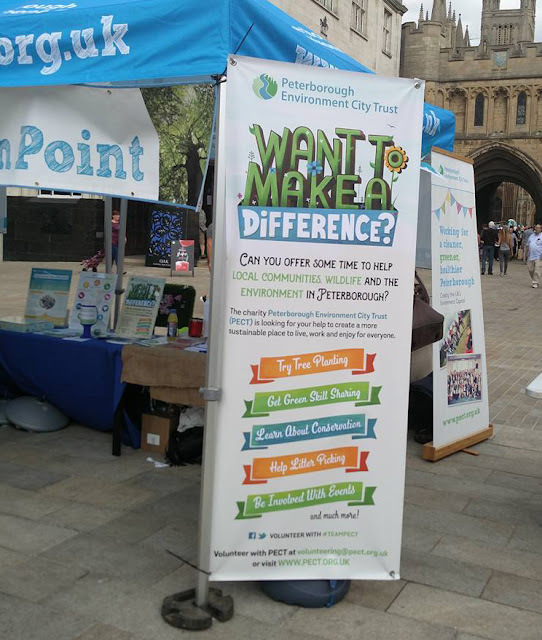 There are lots of stands there and members of PECT explaining the various projects that are going on in Peterborough to protect the environment we have and to create better environments and habitats for wildlife and for people in the future. 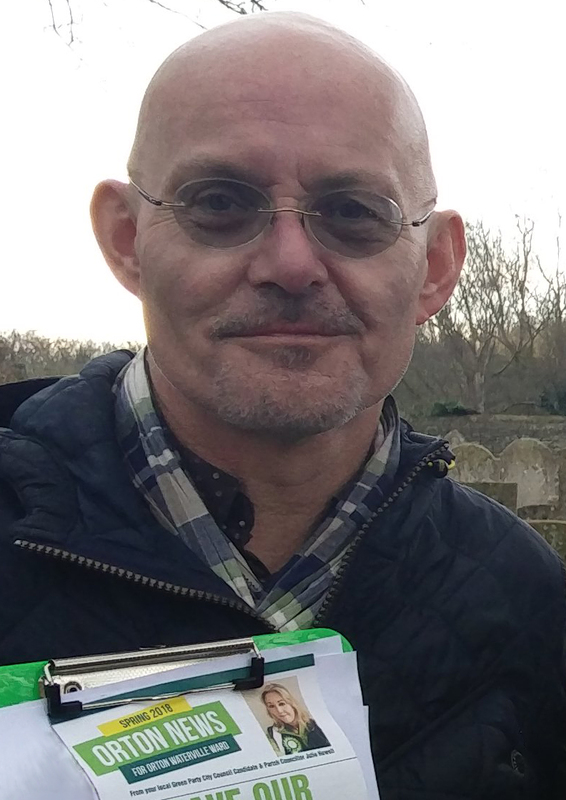 So it’s a really exciting thing to be involved in and I’ve met a lot of interesting people here and I was pleased to tell them about Peterborough Green Party and how we can help them to support this effort. If you would like to support the work of PECT in Peterborough they are always pleased to hear from volunteers. Get in touch via the PECT website at www.pect.org.uk. Well done everyone who was involved today and who gives their time and energy to support PECT and to keep Peterborough beautiful and sustainable for generations to come. When you look at this picture, what do you see? And do you have any idea where this is? It may look like a dried up pond surrounded by trees. That's exactly what it is. 150 years ago it was a mill pond (there's a big clue to the location). However, what looks like something that used to be something to us, is an exciting natural habitat-in-the-making for our local wildlife. 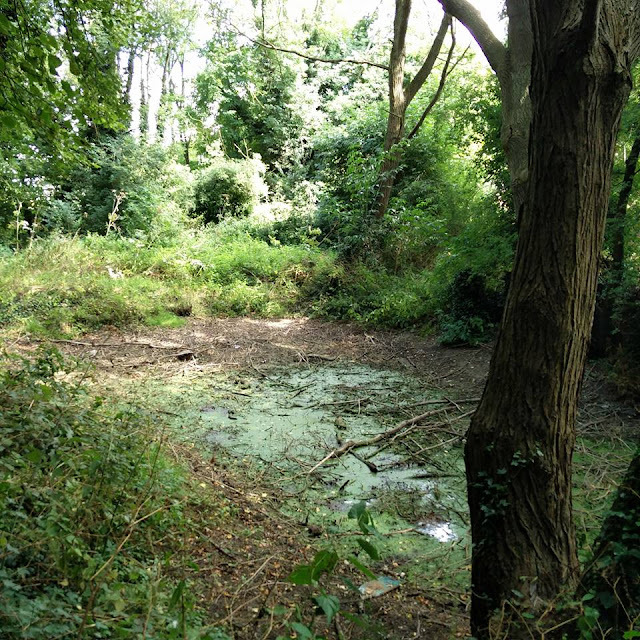 With specialist TLC, this former mill pond has the potential to become an interesting place for people to visit and an area rich in many species of plants and creatures. This little oasis is near to you. For now, it is hidden from view, with no signpost to direct you to it. With a bit of work I hope that in a few years from now it'll be transformed beyond recognition. Watch this space (and others like it). 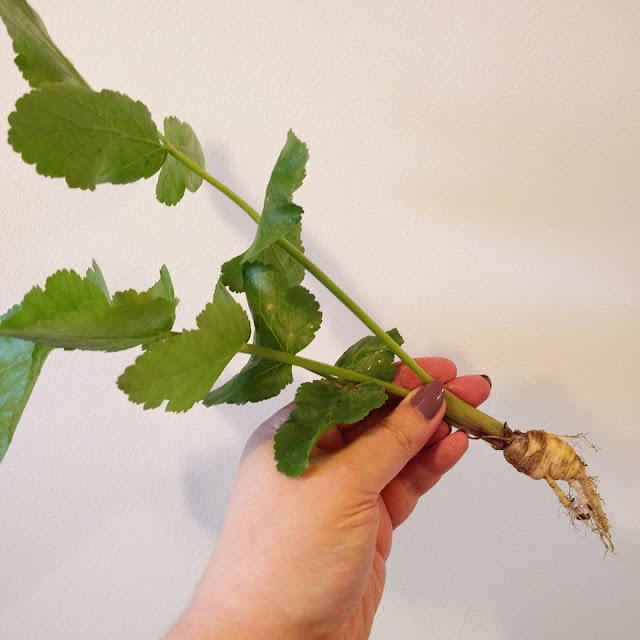 According to my late father and erstwhile gardener, there is no such thing as a weed. "A weed is a flower in the wrong place", he said. While I agreed, letting agents sometimes don't and expect us to keep our garden free of anything that anyone might describe as a 'weed'. This afternoon, I noticed what appeared to be a weed growing out of the gravel that runs down the side of our garage. Definitely no weed. It's a parsnip. How did it get there? Your guess is as good as mine. When I'm not doing this, I have a small business. My small business relies on other small businesses. Small businesses work very hard and times are tough. So whenever they have a special occasion coming up, like a 6th birthday, I like to send them something nice to say thanks. Wherever possible, I like to be twice as nice. And by that, I mean ethical. I prefer to send a gift produced by a small business that is local to them, so I'm thanking my small business supplier and giving business to another small business at the same time. Keeping my carbon footprint small(ish) as well. Have a think. Feel like surprising someone with a gift 'just because'? See if you can find a supplier local to them and be twice as nice. The companies? The supplier of my website is Day Media in Stevenage, Herts (I used to live in Herts). 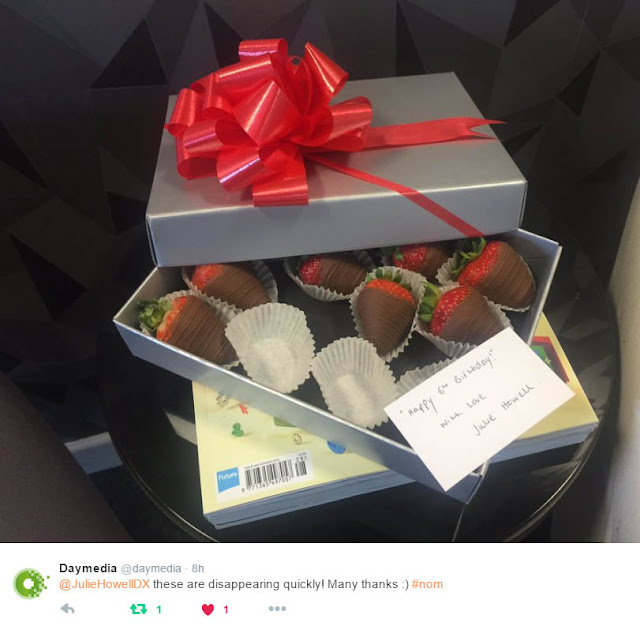 The supplier of the chocolate strawberries is Edible Bouquets, also in Stevenage, Herts.